When a local vehicle manufacturer experienced air leaks in the pneumatically operated components and systems of the specialised vehicles they construct, the company turned to SKF for assistance. 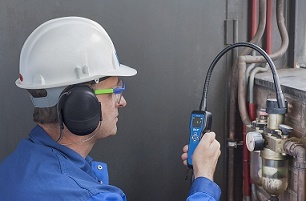 As a global frontrunner in the supply of bearing technology and services, SKF was able to offer a turnkey solution in the form of a high quality leak detection instrument, the versatile TKSU 10 Ultrasonic Leak Detector. Compressed air production is integral for the daily operation of manufacturing plants but is one of the largest energy consumers. Air leaks increase load on the compressor which can lead to not only higher electricity usage, but also to a loss of up to 30% of total compressed air production capacity. The ultrasonic TKSU 10 is a premium quality instrument that detects air leaks and is ideally suited for use in all industries utilising compressed air. This ingenious device is able to identify leaks in pneumatic brake systems, vacuum systems, pressurised gas storage, and steam traps. “The TKSU 10 can be used to verify the air tightness of trucks, buses, passenger and recreational vehicles making it the perfect fit for our customer’s application,” states Eddie Martens, Product Manager, MaPro and Business Development Manager: Training at SKF. Following initial discussions with the customer, SKF visited the vehicle manufacturer’s site to demonstrate the notable abilities of the TKSU 10. “The hand-held instrument enabled us to pinpoint leaks with great accuracy,” notes Martens. “The customer was so impressed with the TKSU 10’s capabilities that they immediately placed an order for two units.” Martens explains that one instrument has been allocated to their final quality control process while the other will be used by their field service teams. The user-friendly instrument’s ultrasound measurement sensor enables operators to quickly and easily identify leaks from a distance, even in noisy industrial environments, with no training required. The TKSU 10 works like a microphone, but is only sensitive to high frequency ultrasound which is not audible to the human ear. This is translated into an audible sound or frequency through a passive industrial noise reduction headset worn by the operator. The headset also features an adjustable volume setting and a neck-band design that enables the operator to wear it with a protective helmet. The ultrasonic leak detector is right at home in varying harsh conditions and efficiently functions at operational temperatures from –10 °C to +50 °C. The instrument is equipped with a flexible probe that helps to find leaks in hard-to-reach-areas. Further adding to the TKSU 10’s impressive features is a built-in colour LED display that affords operators with the option to adjust sensitivity settings and displays the measured ultrasound noise from leaking air (measurement values), allowing the quantification of leaks and prioritisation of repairs. Prime leak detection results are achieved through the coupling of the adjustable sensitivity capability and intuitive guidance system. SKF was responsible for the installation of the two units, which were supplied to the local vehicle manufacturer two weeks after the order was received. “Although the TKSU 10 is very straightforward to operate, we provided our customer with the necessary product training to prevent machine abuse and deliver optimum functionality,” says Martens. “SKF is proud to have supplied this world-class instrument to our customer who we are confident will enjoy its numerous benefits including minimised energy costs, reduced inspection time and increased leak detection accuracy,” concludes Martens.